Endless blue skies, a picturesque plateau, vast desert and welcoming nomadic hospitality is everything that is great about this exploration of Mongolia. As well as this we visit old monasteries, cross part of the great Gobi Desert and exeperience traditional Nomadic hospitality. Upon arrival in Ulaan Baatar you will be checked-in to your hotel where you will have the opportunity to relax after your flight. Largely modernised, this capital city is the hub of Mongolia in every sense and home to nearly half of the country's population. However, despite its concrete façade, many of its inhabitants can be seen in their traditional dress and a huge proportion continue to live in gers in the suburbs. Today, a long yet scenic drive takes us to Hogno Khan Mountain where we will spend the next two nights at our ger camp. Hogno Khan Mountain is a particularly serene spot and you will have plenty of time to explore and relax here. After breakfast there will be the opportunity to hike up Hogno Khan Mountain - a three hour walk that is amply rewarded with breathtaking views from the top. The beautiful flowers and butterflies en route also make it worthwhile. You may wish to visit the nearby freshwater pool and watch the impressive birdlife that inhabits this area. There is a chance to visit the Erdene Khombo monastery, led by a lady abbot located in the mountain nearby. Alternatively, simply relax with a good book and an exceptional view. Leaving Hogno Khan we drive to Karakorum, Genghis Khan's capital in the 13th century. En route, we'll visit the immense Erdene Zuu Monastery - Mongolia's first Buddhist centre established in the 16th century and now an active monastery as well as a museum. At its zenith, there were 1,000 resident monks and, although most of the temples were destroyed in the 1930s, the monastery is slowly being restored and is considered by many as the most important monastery in Mongolia. The political climate in Mongolia is changing and Buddhism, previously suppressed, is currently experiencing a resurgence. On a hill outside the monastery sits an interestingly shaped rock - a reminder for the monks to remain celibate. We also visit the Karakorum Museum which chronicles the history of the Khan Empire along with artefacts from the ruined city. Today we undertake the longest drive of the trip, but the scenery is so spectacular that the eight hours is sure to pass quickly, especially as it is interspersed with plenty of stops. Once again, there are no roads and few tracks to follow. The other thing that will doubtless strike you when travelling through these great expanses of Mongolia is the varied bird life. Mongolian Lark, Demoiselle Cranes and Black Vultures may be seen, to name but a very few. Very bizarrely, this land-locked country also seems to attract many coastal species, such as plover, redshank and avocet. Our accommodation for the night is in a permanent ger camp, so the bathroom and restaurant facilities are in a purpose-built block, as opposed to our previous ger accommodation which had separate kitchen, restaurant and shower gers. Next to the ger camp are the ruins of the Ongi Monastery - once home to over 1,000 lamas until it was destroyed during the Stalinist purges in the 1930s. Today we drive through one of the remotest parts of our planet. The sheer vastness of the desert is awe-inspiring and, as our driver sets off across terrain with no tracks, let alone roads, we marvel at how he knows where he is going. The Mongol culture of today is still mainly pastoral and we hope to come across itinerant herdsmen, a group of two or three families, their gers pitched on the steppe. The nomads live in harmony with their surroundings and move with the seasons. Many rear camels, sheep and goats. It is likely that, at some point during our trip, we will be invited to share a drink of airag or koumiss (fermented mare's milk) with these friendly people. There are many polite points of etiquette to learn, but our guide will help us through these so we do not inadvertently cause offence. The provision of a gift when you visit a ger is part of the culture in Mongolia, so feel free to pack something small. Practical items such as torches or sewing kits, that save a trip to town are often the most appreciated. 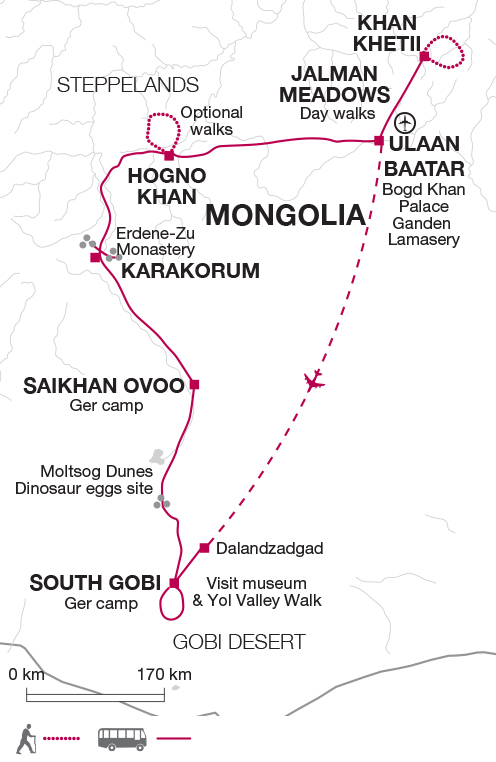 We plan to visit the spot where the first dinosaur eggs were discovered in Central Asia. Moving on again today we make our way to Yol Valley. This gorge sees such little sunlight that there are usually traces of ice even though we are in the middle of the desert. Due to the altitude of the surrounding Gurvan Saikhan Mountains, a temperate ecosystem exists, with argali sheep, ibex and snow leopards living here - as opposed to the desert species we might expect. Our accommodation for the night is in a camp, with the smell of feverfew, camomile and thyme in the grass and looking out over the Gobi Desert and beside a mountain range, this spot exudes peace and tranquillity. We spend today exploring the Yol Valley starting with a visit to the small museum and then taking a short drive to the head of the valley where we take a leisurely walk. The scenery of the valley is very beautiful and has permanent glaciers, small waterfalls and a narrow, steep-sided canyon; rare animals live in the valley including Siberian Ibex, snow leopards and bearded vultures. This morning we will take the short flight back to the capital. In the afternoon we have an opportunity to explore Ulaan Baatar. We will visit the National Musemum of Mongolia, which, although stuck in a time warp from a presentation perspective, contains an impressive array of exhibits taking you through the ancient and more recent history. We will also visit the Bogd Khan Palace. Built at the turn of the last century as a winter palace for the last king and eighth living Buddha of Mongolia, this simple two storey wooden building was, for many years, the tallest building in Mongolia. An early start this morning to watch the lamas partake in their morning prayers at Ganden Lamasery. After soaking up the calm atmosphere, we leave the city and head for the countryside, driving for about three and a half hours through the stunning steppe landscape and stopping to admire the famous huge statue of Genghis Khan en route. Jalman Meadows is the peaceful setting of our semi-permanent ger camp which will be our home for the next two nights. Located in a true wilderness between steppe and taiga forest, the meadow may be covered in a blanket of wildflowers during July and August, with butterflies to rival those found in an English meadow one-hundred years ago. Your Tour Leader will lead you on one of the beautiful walks in the area, depending on the wishes of the group. Alternatively, you may wish to simply relax by the river and enjoy the tranquil surroundings. Today is free to continue to enjoy your surroundings. One option is a two-hour stroll upstream along the banks of the river in the company of a raft-pulling yak. The one-hour drift back to camp is gentle and with a serene soundtrack of birdsong. Whilst life jackets are provided for rafting, to take part in this optional excursion we recommend you are confident swimming at least 25 metres unaided. You have the opportunity to spend the morning as you wish. You might choose to walk in the forest or relax at the ger camp, making the most of its well-stocked 'Library ger'. Or, discovering your inner Mongol, you may choose to challenge the rest of your group to an archery competition, using the camp's kit. After lunch we will drive back to the capital for our final night in Mongolia. Mongolia has an extreme continental climate similar to that of south-central Siberia or Manchuria and enhanced by a mean elevation of 1500m. Winters are long and very cold. There is a swift transition in May to a short, warm summer and an equally rapid return to the winter cold in October. Summer temperatures vary from around 35°C in the desert to as low as 15°C in the mountains. Frost can occur in the mornings in the Terelj National Park. Rainfall is low everywhere; no more than 38-51cm a year in the mountains and as little as 13cm in the drier lowland parts although do come prepared for the occasional downpour. However, temperatures drop very quickly when rainfall does occur. (Rainfall can be heavy, therefore, a good quality rainjacket and waterproof trousers are essential). Be prepared for all weather conditions during your tour. Additional information and climate charts can be accessed at http://www.explore.co.uk/weather. Seasonal weather patterns can be unpredictable. Upto-date information on the weather worldwide can be found by following the BBC weather link on this page. Rafting with yak cart- In Jalman Meadows US$ 15. Horseriding - In Jalman Meadows US$ 7 per hour. Ulaan Baatar - Cultural evening US$ 12. Daytime temperatures are warm and we recommend lightweight clothing plus some warm layers for the drop in night temperatures experienced in high desert areas and mountains of Mongolia. You will also need a good waterproof jacket as rain can be heavy. Light walking boots and comfortable shoes and sandals. One main piece of lockable baggage ideally a soft holdall, kitbag or frameless rucksack. Keep luggage to a strict minimum as you will be expected to carry your bag throughout. Porters are not available in Mongolia. 5kg hand luggage. It is possible to pay for small amounts of excess baggage at a cost of approximately £1 per kilogram. Excess baggage can also be kept securely in Ulaan Baatar until our return to the city. Although entirely voluntary, tipping is a recognised part of life in this region of the world. Some local staff will look to members of the group for personal recognition of particular services provided. Accordingly, you should allow US$ 40 for tipping. In order to make things easier for you, the Tour Leaders may organise a group's tips kitty and if this is the case, they will account for it throughout the tour. Most people spend around $200 to $300 over the two weeks. It is easier to carry your funds in small denomination US$ cash as this is the most readily accepted form of currency for the ger camps. Please bring only clean bills issued after 1991. Can be exchanged in Ulaan Baatar. The ger camps in Mongolia consist of several canvas and felt tents plus a large dining tent or restaurant. Each ger used on this tour has 2 or more beds, bedding, plus a table and stools. All are hand painted in local style. Although they are comfortable, we advise that you try to leave behind your western standards to fully appreciate the atmosphere of these traditional dwellings. Toilet and washing facilities are shared and separate to the living gers, with a mixture of flushing and long-drop style toilets. Should you wish to charge your cameras and electronic devices during your trip, there is electricity in the restaurant gers. Mongolia: A single entry visa is required by British, Irish, New Zealand, Australian, & Canadian citizens and must be obtained prior to departure. A Mongolian visit visa is usually valid for a stay of up to 30 days within six months from the date of issue. All passports must have at least 6 months validity remaining on entry to Mongolia. Nothing compulsory, but we recommend protection against typhoid, tetanus, infectious hepatitis and polio. Please check the latest requirements with your travel clinic or doctor prior to departure. The above is not an exhaustive list. Further information regarding vaccinations and travel health advice can be found by following the NHS and NaTHNaC links at Explore Travel Health and from your local healthcare provider. Visa and vaccination requirements are subject to change and should be confirmed by you before travelling.